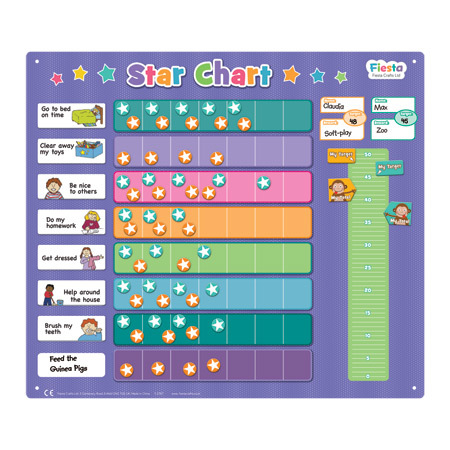 This wonderfully colourful Extra-large star chart for 2 children will encourage them to do the tasks set for them. Its so simple to use; parents and children set the tasks - there are 20 magnetic pieces to choose from or you could use the dry wipe marker to write your own - ranging from going to bed on time, doing homework, tidying up toys or brushing teeth. And of course, youll need to choose the reward for reaching the target! The board itself is also magnetic, so easily attaches to metal surfaces, such as traditional fridges, or can be pinned to a wall. For each child you choose a colour and write in the target for how many stars must be achieved in a week. You can place the Target marker to show each child how far up the points ladder they need to climb to receive their reward. Every time your child successfully completes a task, they receive a star and will love to move their Monkey marker up the ladder to their goal. The Extra-large Star Chart is bright and engaging, and above all, fully interactive. It can be hung on the wall so its visible to everyone. Includes dry wipe pen.